Darling Tilda is coloured with Copics the DP is the gorgeous Pad by Fancy Pants I have used Tim Holts Heart Dies and finished with WOC sweet heart flowers, seam binding ribbon and cute little pearly hearts together with loads of sparkle and pearls. Beautiful card! Fab colours and I love your embellishments! I agree that the colors are splendid for such a feminine card. Its just darling Jan. This is a super card, I the delicate colour and such a pretty layout. So amazing to have you with us on the MM blog. The colours of your card are so beautifull, I love it. So nice to be with you in the MM team. 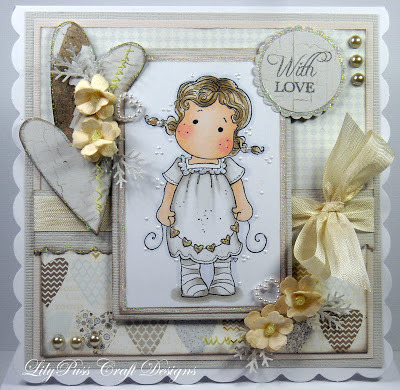 Love the shabby style, the DP and embellishments are so perfect for this card. This is beautiful! Loving your choice of colors, so pretty.